Deena Kakaya's colourful red pepper and goat's cheese bite recipe makes a flavourful snack or canapé. Either serve as a party nibble, or whip up a batch to stuff into pitta for lunch with plenty of green salad. This is the season of emerging colour and gentle excitement, it is my favourite season. My skirts get a good dusting off and the garden tools come out. 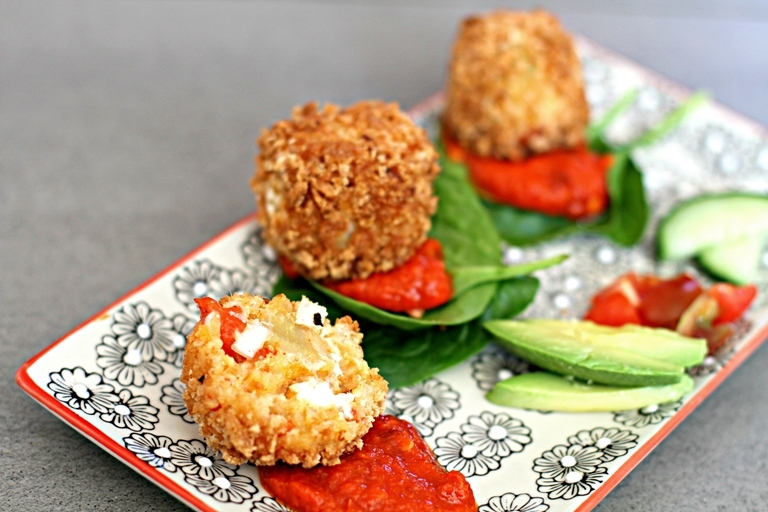 The meals get lighter, more portable and become more of a compilation of bite sized goodies, which is why I thought it timely to share this recipe for crispy red pepper and goats cheese bites; they’re oozy and sweet with cheese and pepper. They’re mild yet lasting and have generous crunch and depth. They are easy to make, for when you have friends over. I used the remaining roasted red pepper to make a quick and easy harissa, the pairing worked! Stir in the spring onions, red pepper, chilli, salt, pepper and mix all the ingredients well.